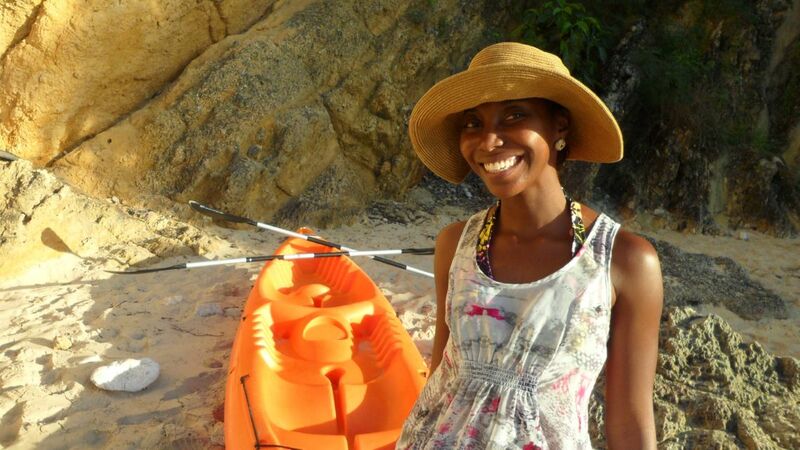 Nash and I had been planning to go to Little Bay Anguilla via kayak for a few months but just never got around to it. On Saturday the 25th January after housework, lunch at Straw Hat and grocery shopping all I felt like doing was taking a nap. Then out of the blue Nash says ‘we should go kayaking.’ ‘Tomorrow’ I mumbled as I rolled over. Then I thought there is really no time like the present. I jumped out of bed and we headed to Crocus Bay. We rented a kayak from Davida Bayside Bar and Grill, grabbed some life jackets and headed to our kayak. We had both been kayaking before so with a little help from the attendant we got the kayak into the water and we were off – destination Little Bay Anguilla. It was a perfect day. The water was calm and the sky was blue. Small boats were scattered on the water and a beautiful yacht was anchored a few hundred metres from the shore. Only one motor boat passed us on our way to Little Bay and the passengers waved enthusiastically at us and we waved back with equal enthusiasm. It is hard to be a Scrooge when you are in a bright orange kayak, when the sun is shining brightly and when the sky is so blue and clear that you can see your reflection in it. Yes, I was feeling happy and relaxed which is actually my usual state but I was really thankful that I had fought the impulse to stay in bed on such a beautiful afternoon. 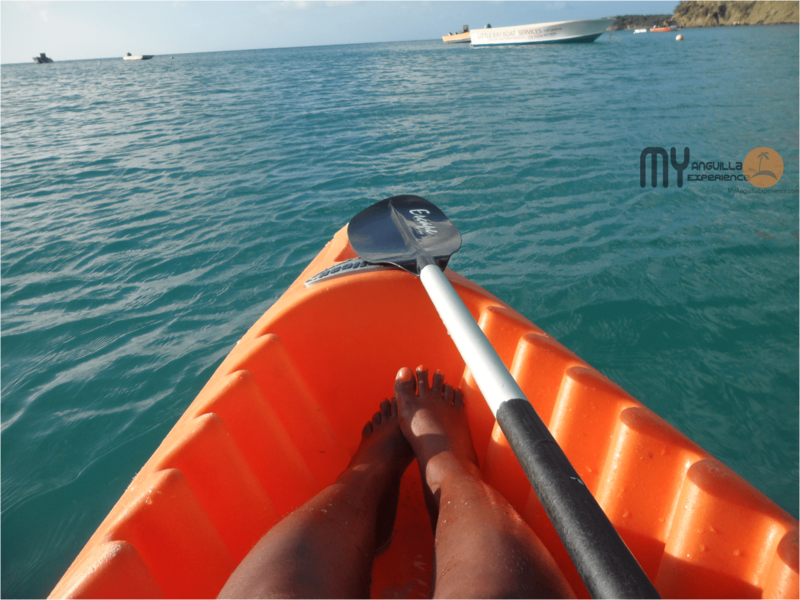 I assisted with rowing periodically because of course it is a ‘team effort’ but spent most of the trip to Little Bay Anguilla relaxing and taking pictures while my strong and agile hubby ensured that we glided smoothly through the water. When we arrived at Little Bay I hopped out of the kayak and just breathed in the surroundings. We were completely alone. We had brought along the camera so we made a video on Little Bay which is below. I then jumped into the water which was cold but refreshing. Right before we left, two others came to the bay by climbing down the rope from the road. One was Her Excellency the Governor, Ms. Christina Scott. They enjoyed some time snorkeling. Did I mention that Little Bay is awesome and also great for snorkeling and scuba diving? I did my Discover Scuba Dive at this picturesque little Bay and wrote about it for Design Anguilla magazine. Anyway do check out these videos on Little Bay and whether you live in Anguilla or you are just visiting ensure that you find your way to Little Bay by rope, kayak, boat or you can simply swim! Enjoy! Don’t forget to like My Anguilla Experience on Facebook, subscribe to us on YouTube for more great videos and follow us on Twitter @ShelleciaB. PreviousEat, Drink, Unwind at Anguilla’s restaurants! NextMy Anguilla Experience celebrates one year and more! Hi Brenda. I am glad you are returning soon so that you will have a chance to kayak to Little Bay. It is true a week is never enough time to do everything. I also need to work out more as I would not have made it to Little Bay on my own:). Thanks for your warm compliments on the blog. Nash and I really appreciate it. There are pics of my hubby (Nash) in some of my blog posts and in the second video he was there briefly putting the kayak into the water. Nash prefers to be behind the camera though but I am working on him slowly 🙂 :). Have a great day! Who knows we may bump into each other when you are back here in Summer. Take care! I am so happy that I came across your blog!!!! We will be in the middle of your Paradise starting this Sunday for 7 days and I’m devouring every bit of information beforehand = I must say yours is so inclusive. I liked your post about CeBlue as that is where we will be staying. Thanks so much for such a great blog! Liz – I am so happy you found my blog and that you have found it useful and inclusive. I love CeBlue and I had the opportunity to tour it a few weeks ago – truly magical. I do hope that you enjoy your stay there. Perhaps we may bump into each other on this tranquil 35 square mile island :). Have fun and do share the blog with others. Thanks for your beautiful words of encouragement.